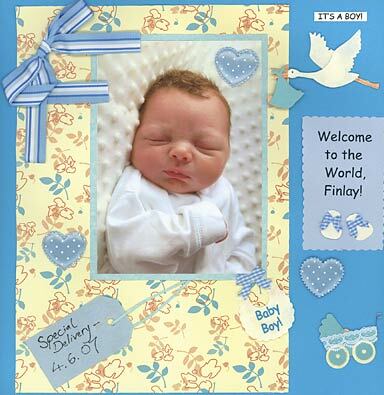 A baby shower idea scrapbook can be great fun at your shower. Why not make lots of scrapping materials available, take a photo of each guest and their gift, and let them make a layout? Most baby showers occur BEFORE baby's born but some prefer a shower AFTER baby's arrival. That's the excuse I'm going to use for showing you my layout of my new nephew! I was so impressed with this photo (NOT taken by me, sadly) that it was a 'no brainer' to give it a page of its own. The journaling in this page is all about welcoming baby, so if you DO hold your shower AFTER baby's arrival you could buy or make embellishments that resemble the gifts that your guests bring. As I mentioned, one way you could combine your love of scrapbooking with the excitement of your baby shower could be to put out a good stash of scrap materials for your guests - you choose the colours! Take a polaroid photo - don't even THINK of cropping a polaroid for a layout. Total acid fest! - of each of your guests holding their gift. Then let your guests dive into your stash and make a page each for your special baby shower album. Another option for your baby shower idea scrapbook would be to take pictures of any baby shower games you may be having. You won't need a polaroid necessarily. Better to take a heap of digital photos and then just print off the good ones, make the layouts yourself, and share the results with your friends and family later. Here is another good resource for Free Baby Shower Invitations/Games including a selection of church forms, certificates, and much more to download. You could also make your next baby shower even more memorable with these fabulous baby shower cupcakes from 'Cupcakes Plain and Fancy'. As you probably realise, my layout is 100% in the blue camp. The internet is bursting with great baby embellishments. I chose this quaint background paper from Rob and Bob's Studio, which apart from matching the blue of my embellishments, has a gentle bedroom wallpaper feel. The Papermania ribbon in the shape of an 'F' was my little flight of fancy!